Our corner sofas are ideal for slotting in to tricky corners of your living room, matching your taste in design and your desire for comfort. Our corner sofas give you extra seating, especially when the dimensions of your living space are restricted. Put simply, they maximise the space you have. 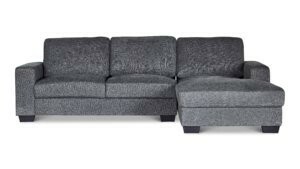 Take our corner sofa; it’s modular, so you can have different combinations, like a three-seater section with a corner seat. Don’t waste your space; use every corner wisely and comfortably with something from our selction of fabric or leather corner sofas.